Wrapping our heads around dieting and nutrition can be difficult. In recent years, it has become increasingly difficult to focus on one set path to take with so many different types of dieting programs, products, and services out there. But in order to succeed at losing weight and keeping a healthy body you need to remain focused while forgetting all the flashy advertisements being thrown around in our periphery. One of the bigger questions today is: How can you fight off hunger urges while dieting? Sure you want to lose weight, but avoiding the fulfilling, fatty foods at your fingertips when your stomach and body is telling you to eat more can be difficult. To explore this further we must compartmentalize this question in order to fully grasp its underlying answers. When the body starts giving signs to the brain that it needs replenishment you should always listen. It’s never a good idea to ignore this request even if you have put yourself on a strict dieting regime. It’s a common misconception that when dieting you need to eat significantly less, or not eat anything at all during certain points in your day in order to lose weight. This is untrue and there is a good way to respond to these physical requests. Eat a stomach trickster. Airy foods that are large in size but light in density can temporarily satisfy your craving. Now I’m certainly not saying this is the ultimate resolution to a hunger crisis, but it can help if you’re having trouble sleeping because of hunger pains and absolutely need something to satisfy this natural craving. Simply put, water helps your body in so many ways. Water isn’t a cure for hunger, but will help compensate for other aspects of bodily functioning (eg. low on energy). Other fluids too aren’t a bad idea if your pallet is craving something more sweet and flavorful. The number one weapon in your hunger fighting arsenal is actually two food groups. They are none other than fruits and vegetables. Vegetables especially are foods that you can have without any limitations or restrictions. They don’t pack as much of a belly filling punch as chocolate cheese cake, but are nevertheless effective. Snacking on fruits and vegetables is generally a good idea anyway as the body responds well to vitamin and nutrient rich foods like these. So pick out some of your favorites and stock up. Incorporating high fiber foods into your diet can really have a positive effect. They are light and heavy at the same time. Heavy in nutritional value and light in all the things you don’t need. Whole grains, beans, fiber based cereals, and many others can help keep your body lean while providing a good source of energy and even mental acuteness. I briefly wanted to mention this recent trend. Supposedly many people are chewing gum while drinking lots of water. I don’t recommend this as I’ve never tried it but supposedly it helps. My best guess as to why is because of a psychological factor. Stimulating the chewing mechanism relays a message to the brain that you’re consuming something when in reality you’re just tossing a rubbery little thing around between your teeth. You could try this one if you were interested in seeing if it might help you. When pertaining to the end of our day, sleep is most important. You need a regular and decent sleep schedule for your body to operate at maximum efficiency. If you’re thinking about food late at night and are losing sleep over it, then try to find a decent healthy snack to hold you over until morning. Ideally, I’d highly advise against late night snacking, but it’s better to be comfortable enough to sleep more, than to worry about eating less. This is an old trick that worked for many, including myself for many years. Chewing ice is a great way to satiate your hunger without taking in any calories. 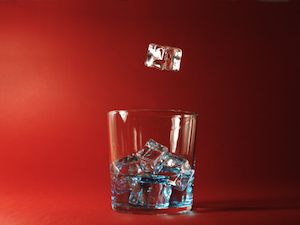 From a dental standpoint, chewing ice cubes isn’t recommended, but chewing crushed or broken down ice can beneficial without too many dental problems. If you want to get really crazy you can add flavoring to the ice for a more flavor stimulating experience. I hope you enjoyed today’s points and wish everyone the best of luck in their quests to leading healthier lifestyles! About the Author – Dan Petraglia runs a weight loss and fitness information blog packed with unique exercise, dieting, and nutrition information, products, programs, and services. you can check it out at fitnessandweightlosscentral.com or follow him on Facebook & on Twitter. Awesome tips! I really appreciate how the advice was very general instead of providing me with a list of a million things I have to buy to be healthy, this serves as a free guideline of things to consider throughout the day of weight loss is on your agenda. Protein helps me not snack. It works miracles!